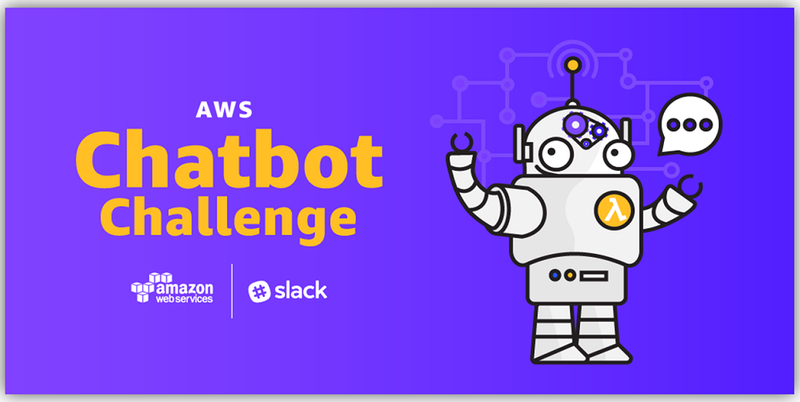 A couple of months ago on the blog, I announced the AWS Chatbot Challenge in conjunction with Slack. The AWS Chatbot Challenge was an opportunity to build a unique chatbot that helped to solve a problem or that would add value for its prospective users. The mission was to build a conversational, natural language chatbot using Amazon Lex and leverage Lex’s integration with AWS Lambda to execute logic or data processing on the backend. I know that you all have been anxiously waiting to hear announcements of who were the winners of the AWS Chatbot Challenge as much as I was. Well wait no longer, the winners of the AWS Chatbot Challenge have been decided. Third Place: PFMBot by Benny Leong and his team from MoneyLion. Let’s take a walkthrough of the details for each of the winning projects to get a view of what made these chatbots distinctive, as well as, learn more about the technologies used to implement the chatbot solution. The BuildFax Counts bot was created as a real solution for the BuildFax company to decrease the amount the time that sales and marketing teams can get answers on permits or properties with permits meet certain criteria. 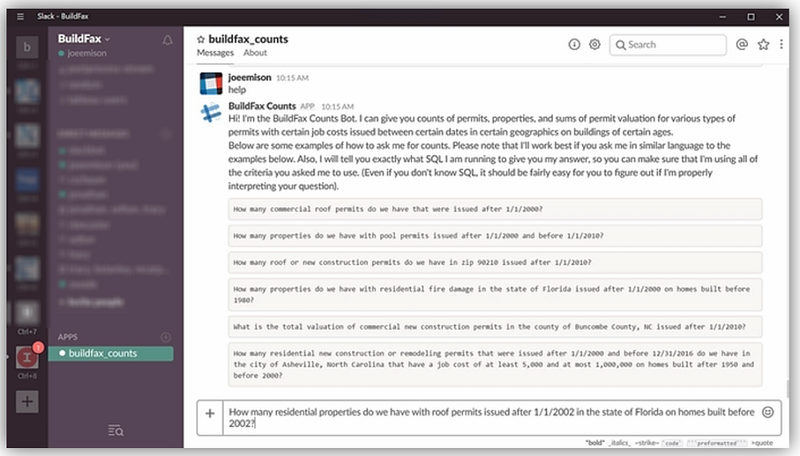 BuildFax, a company co-founded by bot developer Joe Emison, has the only national database of building permits, which updates data from approximately half of the United States on a monthly basis. In order to accommodate the many requests that come in from the sales and marketing team regarding permit information, BuildFax has a technical sales support team that fulfills these requests sent to a ticketing system by manually writing SQL queries that run across the shards of the BuildFax databases. Since there are a large number of requests received by the internal sales support team and due to the manual nature of setting up the queries, it may take several days for getting the sales and marketing teams to receive an answer. The BuildFax Counts chatbot solves this problem by taking the permit inquiry that would normally be sent into a ticket from the sales and marketing team, as input from Slack to the chatbot. Once the inquiry is submitted into Slack, a query executes and the inquiry results are returned immediately. The BuildFax Counts bot is used today for the BuildFax sales and marketing team to get back data on inquiries immediately that previously took up to a week to receive results. Not only is BuildFax Counts bot our 1st place winner and wonderful solution, but its creator, Joe Emison, is a great guy. Joe has opted to donate his prize; the $5,000 cash, the $2,500 in AWS Credits, and one re:Invent ticket to the Black Girls Code organization. I must say, you rock Joe for helping these kids get access and exposure to technology. Hubsy bot was created to redefine and personalize the way users traditionally manage their HubSpot account. HubSpot is a SaaS system providing marketing, sales, and CRM software. 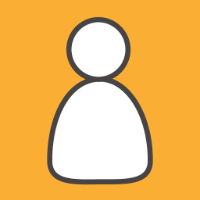 Hubsy allows users of HubSpot to create engagements and log engagements with customers, provide sales teams with deals status, and retrieves client contact information quickly. Hubsy uses Amazon Lex’s conversational interface to execute commands from the HubSpot API so that users can gain insights, store and retrieve data, and manage tasks directly from Facebook, Slack, or Alexa. In order to implement the Hubsy chatbot, Andrew and the team members used AWS Lambda to create a Lambda function with Node.js to parse the users request and call the HubSpot API, which will fulfill the initial request or return back to the user asking for more information. Terraform was used to automatically setup and update Lambda, CloudWatch logs, as well as, IAM profiles. Amazon Lex was used to build the conversational piece of the bot, which creates the utterances that a person on a sales team would likely say when seeking information from HubSpot. To integrate with Alexa, the Amazon Alexa skill builder was used to create an Alexa skill which was tested on an Echo Dot. Cloudwatch Logs are used to log the Lambda function information to CloudWatch in order to debug different parts of the Lex intents. In order to validate the code before the Terraform deployment, ESLint was additionally used to ensure the code was linted and proper development standards were followed. 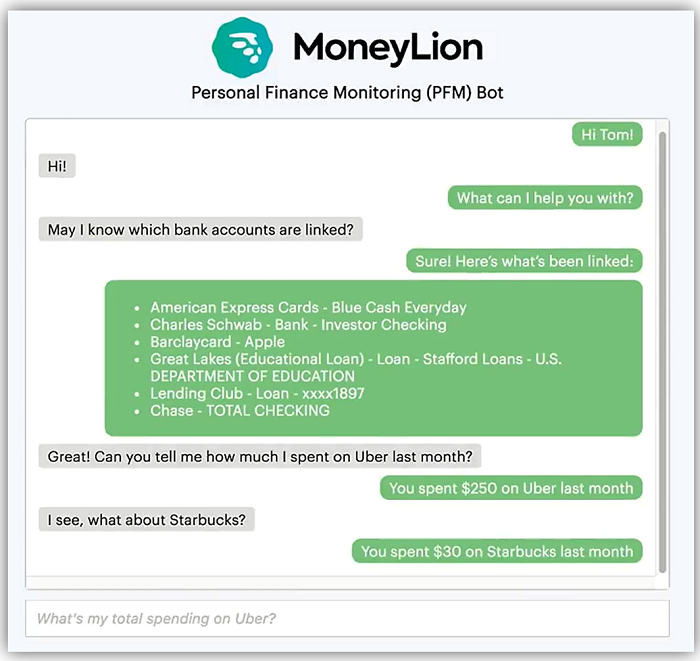 PFMBot, Personal Finance Management Bot, is a bot to be used with the MoneyLion finance group which offers customers online financial products; loans, credit monitoring, and free credit score service to improve the financial health of their customers. Once a user signs up an account on the MoneyLion app or website, the user has the option to link their bank accounts with the MoneyLion APIs. Once the bank account is linked to the APIs, the user will be able to login to their MoneyLion account and start having a conversation with the PFMBot based on their bank account information. ADP PI (Payroll Innovation) bot is designed to help employees of ADP customers easily review their own payroll details and compare different payroll data by just asking the bot for results. The ADP PI Bot additionally offers issue reporting functionality for employees to report payroll issues and aids HR managers in quickly receiving and organizing any reported payroll issues. The ADP Payroll Innovation bot is an ecosystem for the ADP payroll consisting of two chatbots, which includes ADP PI Bot for external clients (employees and HR managers), and ADP PI DevOps Bot for internal ADP DevOps team. The architecture for the ADP PI DevOps bot is different architecture from the ADP PI bot shown above as it is deployed internally to ADP. The ADP PI DevOps bot allows input from both Slack and Alexa. When input comes into Slack, Slack sends the request to Lex for it to process the utterance. Lex then calls the Lambda backend, which obtains ADP data sitting in the ADP VPC running within an Amazon VPC. When input comes in from Alexa, a Lambda function is called that also obtains data from the ADP VPC running on AWS. 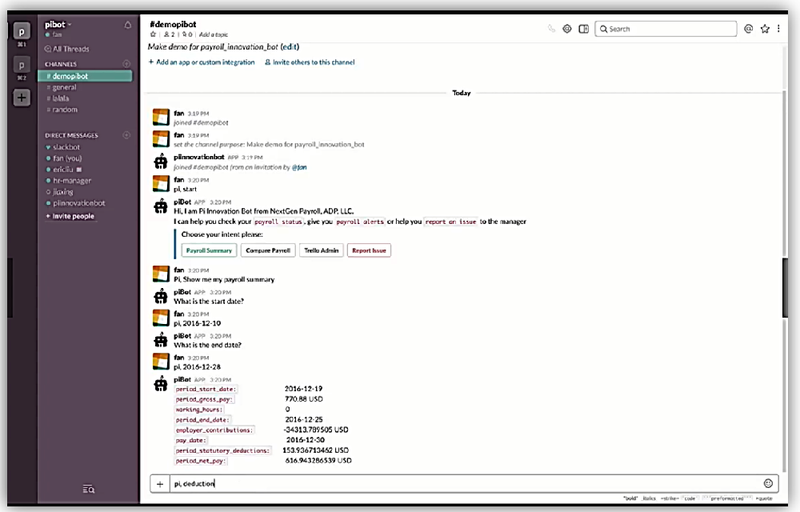 The architecture for the ADP PI bot consists of users entering in requests and/or entering issues via Slack. When requests/issues are entered via Slack, the Slack APIs communicate via Amazon API Gateway to AWS Lambda. The Lambda function either writes data into one of the Amazon DynamoDB databases for recording issues and/or sending issues or it sends the request to Lex. When sending issues, DynamoDB integrates with Trello to keep HR Managers abreast of the escalated issues. Once the request data is sent from Lambda to Lex, Lex processes the utterance and calls another Lambda function that integrates with the ADP API and it calls ADP data from within the ADP VPC, which runs on Amazon Virtual Private Cloud (VPC). Python and Node.js were the chosen languages for the development of the bots. Reduce call volume in service centers (ADP PI Bot). Track issues and generate reports (ADP PI Bot). Let’s all wish all the winners of the AWS Chatbot Challenge hearty congratulations on their excellent projects. You can review more details on the winning projects, as well as, all of the submissions to the AWS Chatbot Challenge at: https://awschatbot2017.devpost.com/submissions. If you are curious on the details of Chatbot challenge contest including resources, rules, prizes, and judges, you can review the original challenge website here: https://awschatbot2017.devpost.com/.